A year ago, Hurricanes Harvey, Irma, and Maria made headlines by wreaking havoc in Texas, Florida, and Puerto Rico. In 2013, Typhoon Haiyan took more than 6,000 lives in the Philippines. Thanks to modern meteorology and the ease of information dissemination on the internet, people knew these storms were coming and how strong they were and yet we still managed to end up with varying degrees of humanitarian disasters. One can only imagine how these storms must have taken people by surprise in the past. Well, not exactly. ​Read more on the blog. As part of HistoricalClimatology.com's Climate History podcast, PhD candidate Robynne Mellor sat down with Professor Dagomar Degroot to discuss his new book, The Frigid Golden Age: Climate Change, the Little Ice Age, and the Dutch Republic, 1560-1720. Though Degroot, who is the director of Historical Climatology, usually conducts the interviews, in this episode, he agrees to sit on the other side of the mic as the interviewee. In the podcast, episode eight of the series, Degroot and Mellor talk about a range of topics including the main themes of the book, the process of writing and publishing, and how US and Canadian higher education compare. The podcast will be of interest not only to scholars of climate change and the Dutch Republic, but also to those who are about to embark on a career in environmental history, as Degroot answers all of questions Mellor has about the field as she reaches the final stages of her doctorate. Georgetown's Dr. Dagomar Degroot and Dr. Bathsheba Demuth introduce "Tipping Points Project"
Co-directors Dr. Dagomar Degroot and Dr. Bathsheba Demuth have launched their "Tipping Points Project." 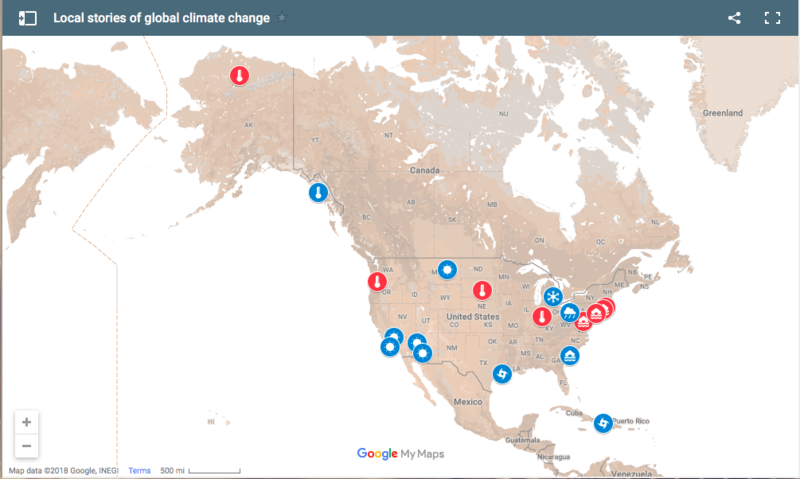 The project includes an interactive map where visitors can click on marked locations and read in-depth, mostly undergraduate-written descriptions of past, present, and future impacts of climate change. The articles linked to the map give information about the impacts of these shifts for local environments and populations. The directors hope their project "turns climate change from an abstraction to a tangible force in people's lives." Each write-up explains how the authors reached their conclusions and what information they used to do so. In addition, the website provides guests with the tools authors used in order for visitors to understand how climate change might impact them. Through transparency and a push for participation, the project helps promote accessibility to what often seems like a large and incomprehensible topic. "Tipping Points Project" has already sponsored one successful and informative event at Georgetown, "The Arctic: Past, Present, and Future," with plans for more in the future. To learn more about the project, discover great research tools, read some of the fantastic articles, visit the website here. ​Skies raining blood, clouds catching fire, and beasts running amok—a surreal mix of fact and fantasy, the kind of which only a malnourished graduate student could conjure up before drifting off to sleep in a cold, dim library. The Ottoman scholar Katib Çelebi (d. 1657) would beg to differ. The setting for these disturbing images, he reported in his chronicle Fezleke, was Hungary in late June 1619, soon after the breakout of Europe’s Thirty Years’ War. The story is loaded with enigmatic symbolism that I dare not explain, at least not today. Below is a rough translation of the Ottoman text based on the version found in Mustafa Naʿima’s (d. 1716) chronicle, whose prose in this passage is a bit clearer than Çelebi’s. Read more on the blog. This April will be a busy month for environmental history at Georgetown with some really exciting upcoming events. The workshops and discussions below cover large stretches of time, from the Medieval period through to the future, and various topics, from disease, to teaching, to climate change. See below for details, and if you are in the DC area and interested in environmental history, please join us. 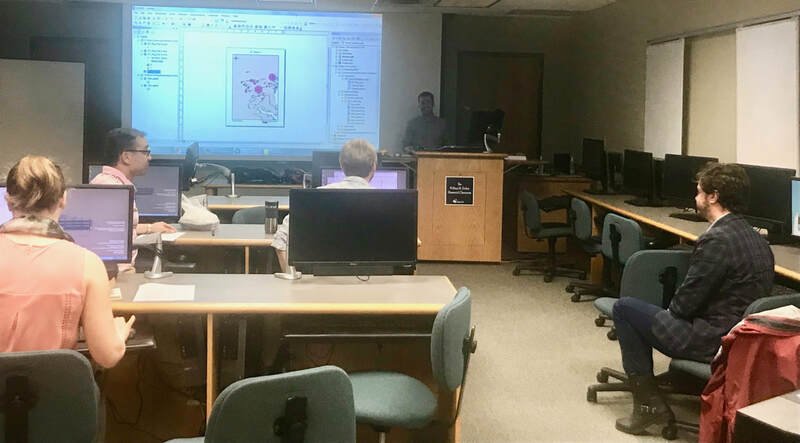 A workshop sponsored by the Georgetown Environmental Initiative & Medieval Studies Program. The workshop hopes to untangle disease-climate interaction in the distant past. It will be an interdisciplinary event, with disease ecologists, dendro-climatologists, palaeo-genomicists and historians. Click here for full schedule. Please contact Timothy Newfield if attending. Dr. Richard Hoffman will discuss a lifetime of teaching and studying the environmental history of the pre-modern world. He is a pioneer in the scholarship of medieval and aquatic environmental histories, and his recent book, An Environmental History of Medieval Europe, is a landmark in his field. Dr. Timothy Newfield and Dr. Dagomar Degroot will begin the event by asking Dr. Hoffman some big questions about his discipline, and then will open it up to questions from anyone else is the room. Dr. Dagomar Degroot will begin by offering case studies on the environmental history of the early modern Arctic. Dr. Bathsheba Demuth will then introduce her work on the environmental history of the nineteenth- and twentieth-century Arctic. Finally, Dr. Matthew Druckenmiller will explain how the Arctic is changing today, project how it might change in our imminent future, and explain what it all means for communities in the far north. This should be a fun, thoroughly interdisciplinary event that offers fresh perspectives on a unique and fast-disappearing environment. Author with bust of German-Australian botanist Ferdinand von Mueller at the Royal Botanic Gardens Victoria. The modern history of the ‘discovery’ of Australia typically reads as a tale of the wider world coming to the island continent, in such diverse forms as European colonists and prisoners, rabbits, California redwoods, infectious diseases, and common law. Less emphasized in this tale is the Australian contribution to the history of other parts of the world. For environmental historians and historians of science in particular, there is no better place to understand that contribution than the library of the Royal Botanic Gardens in Melbourne. Read more on the blog.